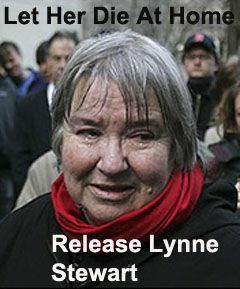 U.S. District Judge John Koeltl has granted a motion from the Government to release attorney Lynne Stewart from prison. Months ago, Judge Koetl said he could not act unless the Government, as opposed to Stewart, made the request. This morning, the Government made the request and this afternoon, Judge Koetl granted it. “The defendant’s terminal medical condition and very limited life expectancy constitute extraordinary and compelling reasons that warrant the requested reduction” in her prison sentence, Koeltl’s order said. Stewart has been imprisoned since 2009 as a result of her conviction for assisting her jailed client, Omar Abdel-Rahman, communicate with his followers. Some more history on her need for early release is here. She's been suffering from cancer since 2006. Stewart's conviction stretched the definition of material support to a terrorist organization to new limits. While nothing can return the past four years to her, at least she will spend her final days with her family. Our best wishes go out to Lynne. New York civil rights attorney Lynne Stewart has the backing of medical authorities at BOP Federal Medical Center Carswell to be released from her 10 year terrorism-related sentence due to advanced cancer. Her request will now go to the BOP and federal court, hopefully for approval. You can read her press release here. Stewart has been battling cancer since 2006. Stewart's conviction stretched the definition of material support to a terrorist organization to new limits. Here's a transcript of an interview she and her trial lawyer Michael Tigar gave after the jury found her guilty. A federal judge in New York today resentenced criminal defense attorney Lynne Stewart to ten years in prison. The sentence was the latest grim chapter in a long odyssey for Ms. Stewart, who was convicted in 2005 of assisting terrorism by smuggling information from an imprisoned client to violent followers in Egypt. Ms. Stewart, 70, who has breast cancer and was given time to seek treatment before her first sentencing in 2006, said Thursday that incarceration was wearing her down. “It’s a death sentence,” her husband, Ralph Poynter, said outside the courtroom. The opinions were issued as the circuit announced it was declining to rehear en banc a November ruling by a three-judge circuit panel that was itself sharply divided over the leniency shown Stewart by Koeltl. On Nov. 17, a majority of Judges Robert Sack and Guido Calabresi faulted Koeltl for failing to make a finding on whether Stewart committed perjury at her trial. In vacating the "strikingly low" sentence, the majority remanded the case and directed Stewart be sent to prison immediately. Two judges issued a dissenting opinion saying they would have granted en banc review. But not because they thought she shouldn't be sentenced more severely. The opinions are here. The Second Circuit Court of Appeals today affirmed the convictions of defense lawyer Lynne Stewart, whose phone calls with her client Sheikh Omar Ahmad Ali Abdel Rahman were taped at the MCC, and her codefendants on all charges, including providing material support to terrorists. We therefore remand the cause to the district court for further consideration of her sentence, in light of, among other things, the charges of perjury against her and of any other matter it deems necessary or advisable, and direct the court to revoke Stewart's and Yousry's bail pending appeal and to order them to surrender to the United States Marshal to begin serving their sentences forthwith.